One way to tune a guitar simply and without a lot of fuss is with a pitch pipe. You need to know how to tune a guitar using a pitch pipe or some other fixed source if you want to play with other instruments or voices. This is the only way to ensure that everyone is playing by the same tuning rules. Besides, your guitar and strings are built for optimal tone production if you tune to standard pitch. There are obviously going to be many times when you are going to want to play your guitar and won’t have a piano around, so you might want to learn a more portable method for tuning your guitar. One smaller and more practical device that still supplies standard-tuning reference pitches is the pitch pipe. Even though the pitch pipe may evoke images of matronly chorus leaders toting a small circular harmonica to deliver notes to their choirs, pitch pipes can work for guitars too. In fact, there are special pitch pipes that include pipes that play only the notes of the open strings of the guitar (but sounding in a higher range) and none of the in-between notes. Unlike the traditional, circular pitch pipe, a guitar pitch pipe is generally rectangular, with six pipes. The advantage of this type of pitch pipe is that you can produce the notes without using your hands. 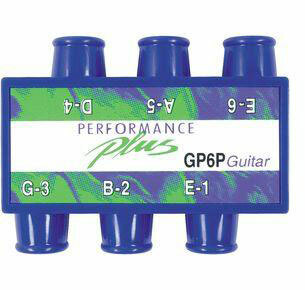 The separate pipes on a guitar pitch pipe allow you to produce the notes while using your hands for tuning the guitar. To tune the guitar, just place one of the pipes in your mouth and blow. Then test the corresponding open string on your guitar. You can blow while strumming to hear them both at the same time. The hands-free pitch pipe allows you to play the reference note and still use your hands to make adjustments to your guitar. The disadvantage to a pitch pipe is that you sometimes take a while getting used to hearing a wind-produced pitch against a struck-string pitch. But with practice, you can tune with a pitch pipe as easily as you can with a piano. And a pitch pipe fits much more easily into your shirt pocket than a piano does!